Last week, I spend a day transiting in London before flying to Brazil. In this post, I will include some pictures and narrate my experience during the short stay there. London is the capital of England and United Kingdom (UK). It is the most populous city in UK with official population of 8.4 million as of 2013. It’s metropolitan area has over 13 million inhabitants. London is the world’s leading financial centres and has the fifth largest city economy in the world. The city generates approximately 22 per cent of the UK's GDP. London is a global city with a diverse range of peoples and cultures. It has strengths in arts, commerce, education, entertainment, fashion, finance, healthcare, media, professional services, research and development, tourism and transport all contributing to its prominence. It also has many world heritage sites. This is my first trip to UK. I arrived at London Flagship Airport - Heathrow, one of the busiest airports in the world with five terminals. The airport is very organized just like Changi Airport in Singapore. Dressed in jeans, sweater and carrying my backpack, I was directed to the “Student Queue” at the custom. Yes, they have a special queue for student, and a long one with majority Asians. I am not a student anymore (how I wish) and eventually did not use the special lane. Custom clearance is relatively fast with friendly custom officer. Next, navigation to find the correct train that will bring me to town. With the aid of signboards and my Iphone App “Citymapper”, it is not difficult at all. I am staying at Ibis Hotel, few hundred metres from Southwark station, which is just one station away from London busiest central station – Waterloo. Trains in London are very crowded during peak hours. At one instance, the carriage is so full that I gave up boarding. However, passengers are orderly mannered, definitely no scenes of pushing and shoving. Trains are divided into carriages and smaller than MRT in Singapore, but it is still comfortable. Lots of walking within the station - you ought to have strong legs and arms while carrying heavy luggages climbing up and down stairs. I wanted to take Taxi from airport to hotel initially, but it does not make economical sense. For hailing a London Black Cab, it will cost approximately GBP80-90 (S$165-185) to travel ~30km. The time is approximately the same as Train - around 70 minutes. Below is a picture of London Black Cab. Road transport is most economical by train or bus. Yes you will need “Oyster Card”. This is similar to Ezlink Card - see below. Not exactly cheap! My average single trip fare is GBP2.20 (SGD4.50) traveling around the city area. In fact I think this is the minimum fare even with one station journey. Single trip fare from town to airport (either way) is GBP5.00 using the Oyster card. London is an expensive city. I cannot see any hawker centres or food courts. Cafes are everywhere though. 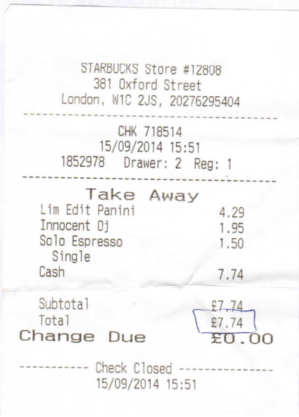 Below is a receipt of a meal from Starbucks. Incidentally it is a very important week for the people of UK, when Scotland decides “Yes or No” to independence. I watched on TV British Prime Minister David Cameron's emotional plea for Scotland to stay. He warned "Independence would not be a trial separation, it would be a painful divorce". Later in the week, results of the voting were revealed. Ultimately, voters decided for a harmonious ending. The weather is perfect, sunshine and temperature around +/-20 deg. Feels great to walk with my cooled shades. But at the end of the day, my legs wobbled. Below are some places I visited with pictures taken. My short one one day experience in London was very enjoyable. It is a beautiful city with many wonderful world heritage sites. I like the diversified cosmopolitan environment. People are friendly and more importantly everyone speaks English. Roads and buildings are clean, neat and tidy, trains are convenient way of transport. However you need a deep pocket in this vibrant and expensive city. I will definitely plan a longer trip there with my love ones the next time. A wonderful sharing and beautiful pictures. I enjoy the write up. Nice stop over. I wish to visit UK one day. Thats a nice round up for a one day trip to London. Thanks for the nice words and I am glad you like the post. Appreciate it. For now, hope you enjoy the rest of the weekend. Hi Gents, Thanks for the nice stopover here!